I bought fleece from Hobby Lobby – I kept going back to use my 40% off coupon. Ha! I bought all the colors of the different Hogwarts Houses. Maeli spent hours on my crappy sewing machine. (Yes it is a cheap piece) anyways she would literally roll out of bed in the morning and start sewing. I tried to use the tutorial from momsminivan for the scarves but sometimes you have to figure it out on your own! My mom came half way through the process and told us that the way we were doing it would take forever. She was right as the directions we were following was going soo slow! (maybe because we aren’t great at following instructions) Once my mom showed us her way those 8 scarves were done in less than an hour! What would I do without my seamstress mother? Look how darling all the girls looked in their scarves. Once the cute scarves were completed and ready to go Maeli found an old top bed sheet (non fitted) in my closet and decided she was going to make a platform 9 & 3/4 for her guest to jump through when they came to the front door. To make this doorway entrance she laid the sheet out on our garage floor. My advice is to lay some cardboard behind the sheet because the paint can seep through. (Speaking from experience) Luckily the paint came off the garage floor with a pressure washer. Anyways, Lay the sheet down and get a normal kitchen sponge. I purchased a package of sponges at the store so both of my daughters could work on this at the same time. They sponged on red paint in the pattern of bricks – just off setting the squares from one another. As you can see in the photo above once the sheet was dry I cut a slit probably 3/4 of the way up the middle of the sheet. This is so the girls could walk through the platform once they arrived. As you can see I added some trunks onto my front porch and an owl. The broom on the steps got used throughout the party. Here is a cute shot of them in front of the platform the day of the party. 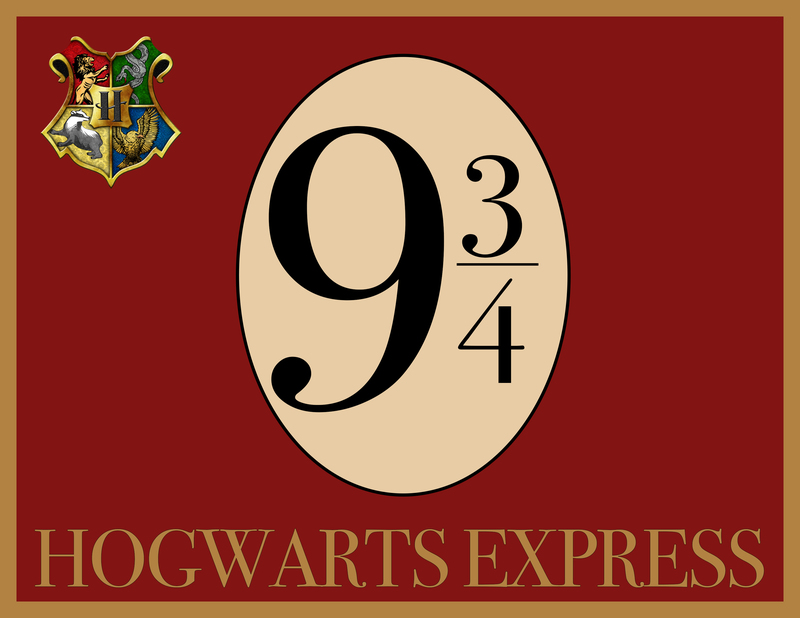 The Platform 9 & 3/4 sign above the sheet is from Jonesing2create. Kudos to her for sharing her printable!! Once the Platform was ready we began to work on the rest of the decorations and fun aspects of the party! You can print out these fun templates for the Bertie Botts candy to give away to the girls as a party favor. The printables can be found at Naphtalismelody. There are holes along the sides. So, I put Jelly Belly’s into a cellophane bag and put them into the Bertie Botts bean box. I pulled the tops of the box together and punched holes into the top. I tied them shut with Baker’s twine. Check out Part one and Part Three of the Harry Potter Party Preparation. I will be adding Parts 4 & 5.